Along with many DXers around the world I chased the VK9WA Willis Island DXpedition. The DXpedition is now history, and I logged several QSOs. Two of those came relatively easy, with the rest more difficult. I failed to get through on 20 and 80, though 80 was almost impossible with 100 watts and a less-than competitive vertical. Most often I missed them because I was unable to get on the air. For the bands where I did get through, 17 and 40 were the toughest. On 17 meters this was due to only having an inverted vee. On 40 this was due to...only having an inverted vee. I used the same transceiver feature to enhance my chances on those bands: dual receive. If you haven't considered this possibility you may benefit from the following description of the tactic that exploits this feature. Dual receive set up for working VK9WA on 40 CW. Notice which RX and TX lamps are lit. 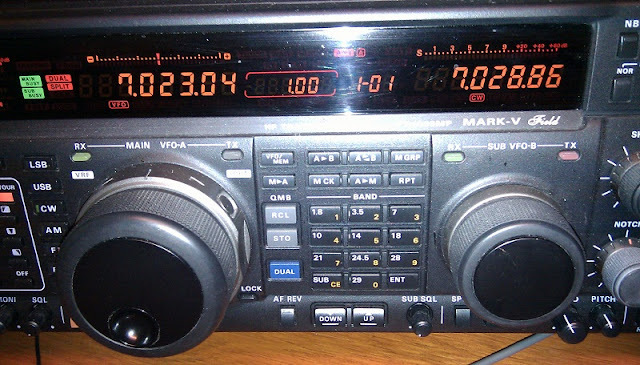 The FT-1000 MP, like a number of other transceivers, has two independent receivers. On some it is built in and on others it is an option. The RF front-end and audio sections are most often common to both receivers. There is only one transmitter, which can be switched between receiver VFOs. Dual (or multiple) VFO transceivers can in some cases be used for the same pile-up tactic, but typically not to the same degree of effectiveness. I will focus on "true" dual receive rigs. You may also be able to do it on an SDR rig. At first blush one might think dual VFOs are enough, or even just RIT & XIT. You tune the VFO to DX transmit frequency and use XIT or the other VFO to transmit split. The second VFO or RIT/XIT offset knob is tuned to find the station the DX is working. This is the pivot position from which you set the transmit frequency in preparation for your call. Where you tune of course depends on the DX listening pattern and your guess at where he'll next listen. This is the common approach. There are problems doing it this way, even if it suffices in most cases. First, the RIT knob is typically small and has a fine tuning rate. That slows you down when you need to move quickly. This is in addition to pressing the RIT button a couple of times: once to switch from listening to the DX to the pile-up and again to go back. With a good DX operator you may have just 2 seconds to find the station and another second to set the frequency for your transmission. Another problem is that you can only listen to one frequency at a time. It is easy to miss the completion of the QSO. The DX operator most often sends a simple "TU" on CW, which you can easily miss, you end up missing your turn to call. Or you call when you should not, or press the wrong button and call where you should not. It's easy to do, unfortunately. The RIT/XIT knob on the FT-1000 MP (outside the frame of the photo above) is the same size as the small knob at the lower right. RIT and XIT states appear on the lower right of the main display when enabled -- which they are not in the photo since I'm using dual receive. It is difficult to spin the RIT/XIT knob quickly, plus the tuning rate is slow and the maximum offset is 10 kHz. These were all impediments in the VK9WA CW pile-ups. Dual receive drastically changes the situation to your advantage. There are ways to best use the feature. Main receiver fixed on the DX transmit frequency. The sub-receiver is used to find callers and to transmit. Start by tuning to the DX on the main receiver and pressing A->B (or equivalent) to bring the sub-receiver to the same frequency. Activate dual receive. In most rigs this routes the audio of each receiver to one side of the stereo audio output. Obviously this works best with headphones. Adjust audio balance so that the main receiver audio is at full volume and the sub-receiver at reduced volume. You need to clearly hear the DX. The pile-up at low volume almost always suffices. If the audio balance feature isn't available you can try positioning the ear piece corresponding to the sub-receiver partially off your ear lobe. Find the caller with the sub-receiver and decide whether to offset up or down, and how much, to make your call. As in any pile-up you'll soon discover the pattern and if conditions are favourable you'll make the QSO. With true dual receive you have the choice of roofing and IF filters and DSP on each receiver to improve reception. I use the full force of what's available on the main receiver to cut the clutter of QRM, be it deliberate, ignorance or error in setting split. However, on the sub-receiver I leave the IF wide open. On CW this means using the SSB filter (2.7 kHz). Sound like an odd choice? It is often the right choice. Let's see why that is. You'll find the calling station faster. Often you won't even have to shift the sub-receiver to hear the caller since the DX usually shifts listening frequency in small steps, steps that are well within the wide filter's bandwidth. The intent is not to copy the caller well, only to identify which signal it is. The successful ham's transmission is a giveaway. You'll hear something like "R" first, or just "5NN TU", which is very distinctive in comparison to the horde sending their calls. And make no mistake, just because the DX calls a specific station other stations don't shut up. The QRM is non-stop on the rare ones. It made be rude and unfair, but you must play the hand you're dealt. Complaining won't get the DX in the log. Only if you don't hear the caller should you tune the sub-receiver. If you can, remember your starting point since you may want to flip back there if you fail to find the caller (happens a lot) and the DX pattern is to make small offsets between QSOs. Be careful with the knob since it tunes very fast in comparison to RIT. The speed is only a benefit if you have a steady hand. In most pile-ups the callers tend to cluster around the last successful caller. In response the DX will often spin randomly or will make large frequency shifts every few QSOs. You'll respond to those more quickly than others with the wide receiver filter. Not only can you find the caller faster this way you never miss when the DX resumes transmitting. The number of potentially winning calls is much higher with dual receive. Another thing you can do is discover if the DX ever hunts out the relatively sparse areas in the listening window or the fringes to find stations that are easier to copy. Some of the VK9WA operators did so. This happened a couple of times while I tried to get through on 17 meters, with the DX occasionally listening up +10 to +12 kHz rather than the more usual smaller split. So I moved up there and within a minute had them in the log. That was easier than working hard on every call to stake out a calling frequency. I might not have gotten through otherwise. Dual receivers are pretty much necessary to use the described tactics. It may not be adequately achievable with either software VFOs or SDR. For example, the use of roofing filters requires that two software VFOs must tune within the pass band of that roofing filter. Otherwise the DSP bandwidth filter can't do its job. Additional hardware that includes at least a portion of the receiver electronics is needed. If your rig already has dual receive you are set. Otherwise be prepared to pay in the vicinity of US$500 to add it, if the option is available. For those for whom chasing the rare DX is a passion the cost is almost certainly acceptable. Only you can decide whether the value of this feature is worth the cost. I didn't choose the FT-1000 MP for this feature, but I am glad that I have it.